A new study suggests that pregnant women are twice as likely to be iron deficient than non-pregnant women, and the number of pregnant women with inadequate iron stores was higher than expected. Results showed 30% of women assessed during their third trimester were iron deficient, with the highest prevalence of iron deficiency among black and Mexican American women. The study used a new method of iron testing called “total body iron” which may be more accurate than tests which are usually used to assess iron status. This study reinforces the importance of iron supplementation during pregnancy to prevent iron deficiency and anemia which is associated with risk of low birth weight, preterm deliveries, and perinatal mortality. Iron is an important mineral that is needed in higher amounts during pregnancy. Not only is it needed for the growing baby and placenta but also to make hemoglobin- a protein in red blood cells that carries oxygen throughout the body. Pregnant woman are at higher risk of becoming iron deficient because during pregnancy the amount of blood in the body increases to almost double the pre-pregnancy amount. More hemoglobin is needed for the higher amount of red blood cells, and therefore iron is in higher demand. 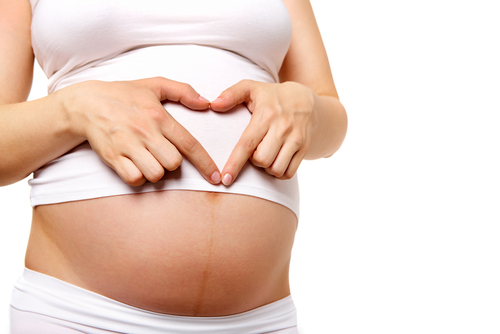 Pregnant women need an additional 9 grams of iron each day above pre-pregnancy requirements. Be sure to eat plenty of iron rich foods and take a prenatal vitamin to help meet the required 27 mg of iron each day during pregnancy. If you are taking an additional calcium supplement, be sure to take this at a different time than your prenatal or iron supplement, as iron blocks the absorption of iron. Polyphenols found in tea and coffee can also hinder iron’s absorption so don’t use these beverages to wash down your iron supplement. To help the body absorb iron, consume a vitamin C-rich food such as a citrus fruit or juice, strawberries, or bell peppers which enhance iron’s absorption. Fruits, vegetables, and grains can be good sources of iron but are not as well absorbed as meat sources. If you are eating a plant source of iron, such as beans, adding a small amount of meat can help absorption of the iron from the plant source. For example adding some fish or chicken to a bean quesadilla can help iron from the beans be better absorbed. Non-animal iron-rich foods: beans, lentils, tofu, raisins, dates, prunes, figs, apricots, potatoes (leave the skin on), broccoli, beets, leafy green vegetables, whole grain breads, nuts and seeds, blackstrap molasses, oatmeal, and iron-fortified cereals. Remember that it’s a good idea to eat some of these plant sources of iron with a vitamin C rich food and if you’re not a vegetarian, try to include a little bit of meat to help absorption.